And also Hello ;-D It has been a wonderfully busy time and I am shocked (shocked I tell ya!) that it has taken me a week to get back on the blog. I have actually been coloring but just not "assembling" ...but that all changed today! Today it was miserable out and so I got down to business. I am really diggin' the larger card size. For so long I felt like it was a struggle to fit what I wanted onto a traditional 4 1/4 by 5 1/2 card size. And, in line with that, I often churned out the same layout over and over again. When it came to trying new things, new types of embellies or accents I generally held back as it seemed too "crowded" looking on my cards. But, I have been playing around with 5 by 6 3/4 cards and it has been really refreshing to experiment with a larger canvas. If you haven't ventured out of the traditional note card size I urge you to try it. It really can wake up the creative spirit within you! So, that all being said, today I have two cards. They were FUN to make and I hope to improve on my basic layouts. I am a terrible sketch person and so am challenging myself to learn more styles of card layouts. I am always in awe of the various ladies who can create such diverse cards. And so many of you out there have a really incredible "eye" for overall card design. So, on the hunch that you are perhaps sick of me droning on endlessly and are really visiting my blog for cards rather than personal opinion I will show you what I have worked on today! 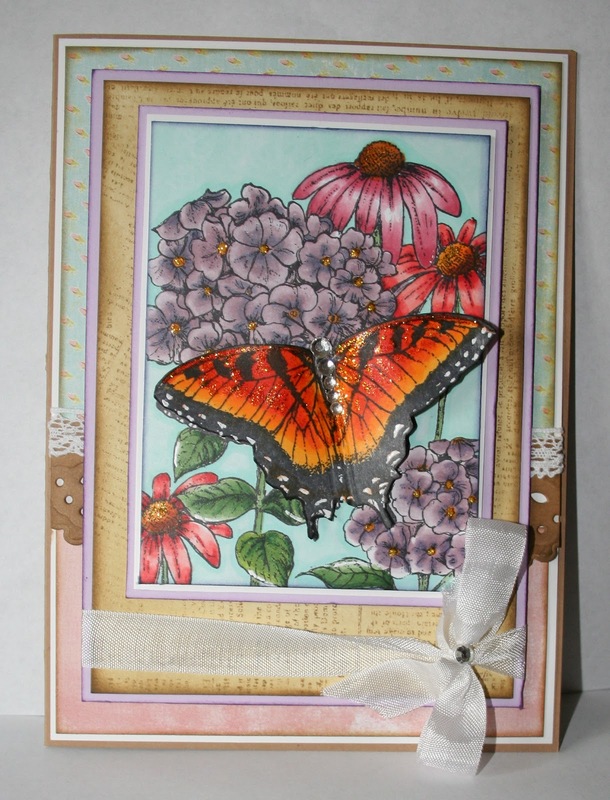 Both cards use both Northwoods Rubber Stamp Co images as well as Hero Arts stamps. And, both cards are colored with Copics, distressed a bit and stickled. 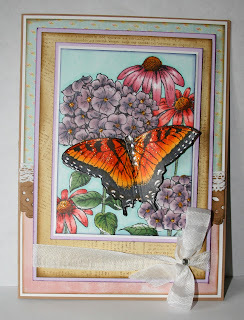 I have used the HA "Friend Definition" background stamp for this first card popped up and curled the wings of the butterfly. Thank you for stopping by and I hope your lives have been as busy and enjoyable as my own has been! Just seen these over on Flickr Sheila. Your Copic colouring is stunning. Both cards are just awesome. 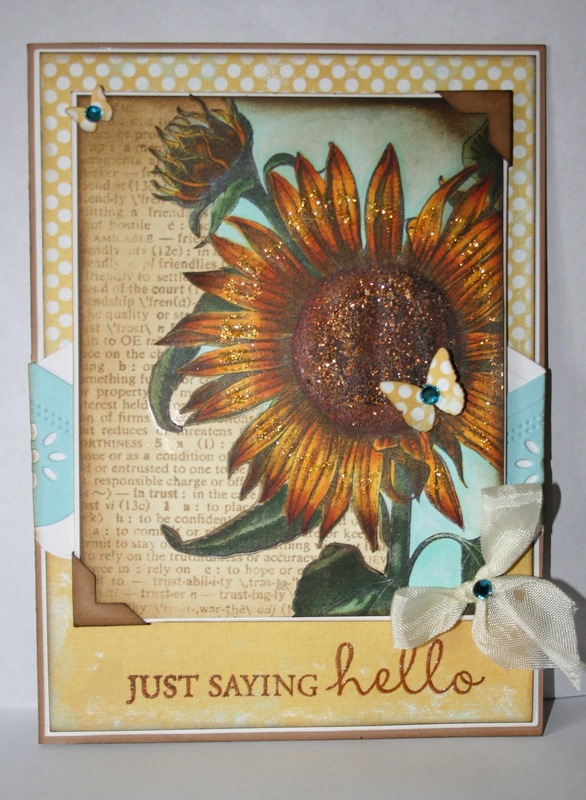 Both of your cards are just beautiful, Sheila! I love the way you've taken to the larger card size, too. Very well done! Visiting here always brings a smile - or, a big old huge grin! I love the note about the card sizes.....a very good thought. Sometimes I can't even "fill" a smaller card! Love your coloring on both of these cards - has your style changed as a result of your Copics classes? 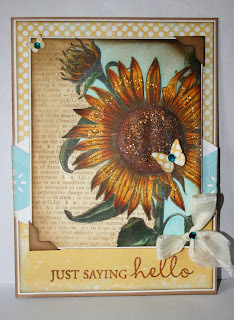 Wonderful combos of stamps, backgrounds and layers of color. Great to see what you've been up to! Oh my goodness, your colouring is always so impressive! These are beautiful Sheila! I don't think I could make larger sized cards as even a scrapbook layout scares me to death, but you made some masterpieces here! Sheila I can see how much fun you are having with your larger sized cards. Great designs and balance!